That’s “着度中에는 安全帶를 매십시오” and “救命胴衣는 座度 밑에 있습니다” in case the image doesn’t show up. This makes me think two things. 1) I really need to practice my Korean typing again. That took way too long to write. 2) This is probably an old airplane. I’m pretty sure newspapers, even conservative ones like Chosun Ilbo (조선일보/朝鮮日報), stopped using mixed-script in the mid-1990s. I certainly never saw it when I lived there with the exception of a 美 or 大 here and there. Planes get used for a really long time, and this one certainly had some thai cosmetic issues to account for years of service. There are a number of textbooks that include mixed-script texts for the sake of learning hanja, but little else is currently printed in that way. It’s almost too bad. It’s a nice look, and knowing a few more hanja probably wouldn’t hurt anyone. But then it’s not doing a lot for improved literacy rates this way. I was a little surprised to see an article this morning about Lyu Xinhua. 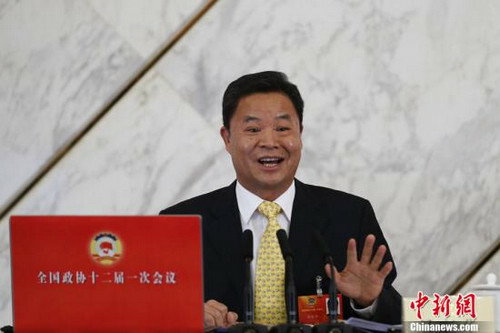 At 62, veteran diplomat Lyu Xinhua was given a new job: the spokesman of China’s top political advisory body. Lyu is not a typo. The Xinhua Agency seems to use this spelling of his family name consistently. Here’s the man himself. While in Taipei this past week I ended up at the Islamic Cemetery (回教公墓, المقبرة الاسلامية) near Liuzhangli Station. It’s one of many cemeteries that wrap around the mountain, any one of which could easily take up a full day of wandering around, inspecting inscriptions. There was an interesting mix of Chinese and Islamic cemetery aesthetic. And rather than swamp RSS feed subscribers with a bunch of pictures, here’s a link to a Google+ photo album with a dozen shots of the area. The most interesting thing was the use of Sini script on a number of the inscriptions, such as that in the photo above. We’ve talked about Sini a little here before. To recap, it’s a form of Arabic calligraphy unique to China’s Muslim ethnic minorities. And without having actually done a lot of research on this particular cemetery, most of the signs pointed to the graves belonging to members of the Hui minority, or rather what would be called Hui in today’s PRC; Many stones had Arabic names that didn’t phonetically match the Chinese names, and a lot of the Chinese family names were 馬, a name common among Hui, originally chosen as a phonetic approximation for earlier generations’ Arabic names. At any rate, it was nice to see the regular use of Sini, as well as being a good reminder of the wide range of people who came to Taiwan as the Communists took power. Check the album for more photos. Whether Chinese is a single language or a group of languages depends on the judgment criteria applied. The view that Chinese is a single language is reflected in Chinese linguistic literature. In the Western literature, however, Chinese is often regarded as a language sub- family containing separate languages like Wú 吴语, Mandarin 官话, Xiāng 湘语, Gàn 赣语, Kèjiā 客家话 (Hakka), Yuè 粤语 (Cantonese 广东话), Mǐn 闽语 (Hokien 福建话), etc. The linguistic differences between them are admittedly as large as those between, say, English and German or even larger. However, the shared culture, the uniform writing system, the same linguistic norm, and especially the common psychological identification by the speakers of these varieties make the identifying task relatively simple: Chinese is a single language with arguably the greatest linguistic diversity among languages. Chap. 18, Section VI of that fourth edition offers us a single paragraph on Chinese language. His sources seem to be Matteo Ricci and Nicolas Trigault, to whom he admits, somewhat grudgingly, that he is indebted. I would like to wish all of our readers a very happy and healthy 2013, and offer you Purchas’ account of language in China. If you haven’t already, head over to China Digital Times and check out the post on dying languages in China. Obviously it’s a topic close to our hearts here at Sinoglot. I was asked about this yesterday, and frankly I just don’t know the answer. But someone here might. Wiktionary has a reference in a couple different places of 七 transcribed as shǎng. I asked a couple other people about this but with no luck. Is there such an alternate pronunciation? Is it a regional thing like 两 as the standard 2 in Wu or 幺 not showing up in Taiwan outside of the military? Steve pointed out the likelihood that Wiktionary is just wrong. I can accept that. But since it’s in a few different places we thought it might be worth asking about here.